Cyclophosphamide, also called Cytoxan, is classified as a “cytotoxic agent”, because it has a toxic effect on many types of cells (“good” cells as well as “bad”). Cyclophosphamide is one of a number of medications first developed as a chemotherapy drug (a medication used in the treatment of cancer). It was discovered that — in addition to its usefulness in cancer — cyclophosphamide also has a significant ability to suppress the immune system. Thus, the medicine is very effective in the treatment of immunologically–mediated diseases, including some forms of vasculitis. In general, much lower doses of cyclophosphamide are used to treat vasculitis than are used to treat cancer. However, the doses of cyclophosphamide used to treat vasculitis are still high enough to cause a significant number of side–effects, and the drug must be used with great caution. In this section, we review the side–effects of cyclophosphamide. After reading through the many possible side–effects, a reasonable person might conclude that the treatment appears worse than the disease it is intended to treat! 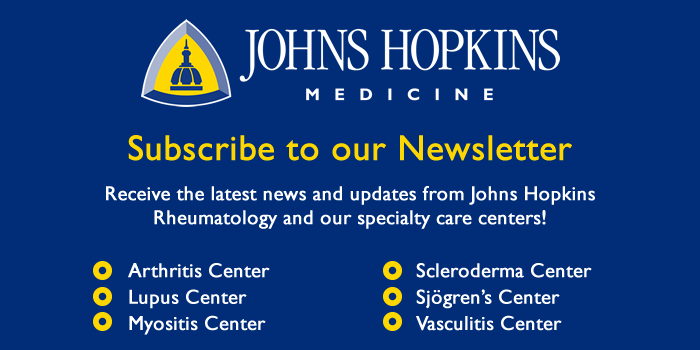 We emphasize, however, that for some forms of vasculitis that do not respond to steroids (prednisone) alone, cyclophosphamide may be a life–saving medicine. For example, before the introduction of cyclophosphamide in the treatment of Wegener’s granulomatosis in the 1970s, Wegener’s was almost invariably a fatal illness, even with high doses of steroids. Now, with the combination of cyclophosphamide and prednisone, more than 90% of Wegener’s patients respond to treatment, and 75% enter a disease remission. Other types of vasculitis in which cyclophosphamide is sometimes used include: polyarteritis nodosa, microscopic polyangiitis, the Churg–Strauss syndrome, cryoglobulinemia, central nervous system vasculitis, rheumatoid vasculitis, and other types of vasculitis that are refractory to prednisone and other medications. Cyclophosphamide is usually used in conjunction with steroids (prednisone). It frequently helps decrease the doses of steroids that are necessary to control vasculitis. In this regard, cyclophosphamide is sometimes referred to as a “steroid–sparing agent“. For the most part, the potential side–effects of cyclophosphamide differ from those of prednisone. For example, unlike prednisone, cyclophosphamide is NOT associated with the weight gain, bone thinning, increased blood pressure, or a tendency to induce diabetes. However, cyclophosphamide does significantly increase a patient’s risk of certain types of infections (see below) and has several other potentially very serious side–effects, including an increased predisposition to certain types of cancer. We discuss the possible side–effects of cyclophosphamide below. Cyclophosphamide may be administered either intravenously (approximately once a month) or orally (once a day, typically in a smaller dose). To some degree, the side–effects of cyclophosphamide differ according to the way the drug is administered. “Thrush” — Thrush is a fungal infection of the mouth caused by Candida. It generally appears as white spots on the inside of the mouth (pictured below), and is easily treatable with the use of anti–fungal mouthwash or troches. Sometimes Candida infections also involve the esophagus (the “food tube” leading from the mouth to the stomach). This condition, called “Candida esophagitis”, often results in pain on swallowing, and must be treated with potent anti–fungal medications such as fluconazole. “Shingles” — or Herpes zoster. “Shingles” results from reactivation of the virus that causes chickenpox (Varicella zoster). Nearly everyone who is now older than 5 had chickenpox at one time, generally as a child. Normally, even after the rash and other symptoms of chickenpox subside, the virus that caused the sickness continues to reside in the body in a “dormant” state, hiding in the root of one of the nerves along the spine. Decades later, as the immune system wanes slightly with age (a normal part of the aging process) or when the immune system is suppressed (by medications such as cyclophosphamide), the virus becomes active again. When it reactivates, Varicella zoster usually causes a painful rash in the distribution of a single nerve, such as over one side of the face or down one arm. The rash is characterized by groups of small vesicles (blisters) sitting on a base of reddened skin, and may be extremely painful. “Shingles” is treatable with anti–viral medicines such as acyclovir or famcyclovir. These should be instituted as soon as possible. Narcotic pain medicines may also be necessary for several weeks. In a small minority of cases, “shingles” results in pain that can last for months. This condition is called “post–herpetic neuralgia”. 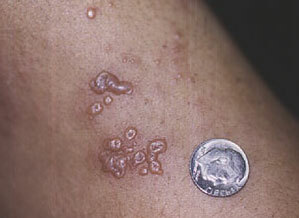 An example of the classic rash of “shingles”. Pneumocystis carinii pneumonia (“PCP”) — Pneumocystis carinii is a fungus that resides within the lungs of most people. People with intact immune systems have no trouble keeping the organism at bay. In patients who are immunosuppressed, the organism can cause a serious type of pneumonia: PCP. A few years ago, PCP was the most common cause of serious lung infections in patients with AIDS. Because of advances in the treatment and prevention of this condition, PCP is now a much rarer problem in AIDS. Similarly, PCP may also be prevented in patients with vasculitis by having patients take certain types of antibiotics daily or every other day. The antibiotics most commonly used for this purpose are trimethoprim–sulfamethoxazole (Bactrim, Septra) or, in patients who are allergic to sulfa medications, dapsone. Warts — The picture below shows a proliferation of warts in a vasculitis patient on immunosuppression. The development of warts to this extent is quite unusual. The bone marrow is the organ of the body that makes red blood cells (which carry oxygen), white blood cells (which fight infection), and platelets (which help the blood clot). Nearly all patients treated with cyclophosphamide experience some suppression of the bone marrow’s ability to produce these vital blood elements. Thus, careful monitoring of blood counts is essential during cyclophosphamide therapy. Suppression of the bone marrow by cyclophosphamide is usually transient — i.e. responsive to a decrease in dose or discontinuation of the medicine — but dangerously low levels of any of these three cell lines (or even permanent bone marrow failure) may occur. The white blood cells are the cell line that is usually most sensitive to the effects of cyclophosphamide. When cyclophosphamide is given intravenously, the white blood cell count tends to reach its low point (“nadir”) between 7 and 14 days after administration. Therefore, blood cell counts should be measured approximately 10 days after the administration of cyclophosphamide, and repeated as often as needed to insure that the counts do not go too low. This normally means checking blood counts every 2–4 weeks. When cyclophosphamide is given orally (i.e., every day, rather than once a month), blood counts should be checked about 7 days after starting treatment and then not less frequently than once every 3 weeks. At some centers experienced in the care of patients with vasculitis and the use of cyclophosphamide, blood counts are checked every 2 weeks. Pictured is a woman with microscopic polyangiitis treated with intravenous cyclophosphamide and high doses of corticosteroids. 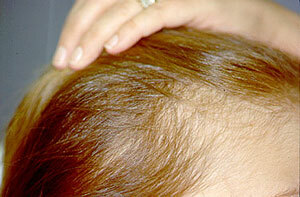 After several cyclophosphamide treatments, she developed a marked (reversible) thinning of her hair. Many of the side–effects of cyclophosphamide are most likely to occur while the patient is taking the medication. With those side–effects, the risk of their occurrence diminishes greatly after discontinuation of the drug. In contrast, the risk of cancer associated with cyclophoshamide use may continue for many years, even after patients stop the medication. The risk of cancer appears to be dependent upon the length of time patients have taken the medication and the cumulative dosage of the drug. Patients who have taken cyclophosphamide have an increased risk for at least two primary types of malignancy: leukemia/lymphoma and bladder cancer. There may also be increased risks for other kinds of cancer, but the risks are less high. Leukemia/lymphoma — One of the long–term side–effects of cyclophosphamide use is a significant increase in the risk of bone marrow and lymph node cancers (known as leukemia and lymphoma, respectively). Physicians are currently unable to predict which patients will be at risk for these complications. The best means of avoiding these types of cancer is to use cyclophosphamide judiciously: the lowest possible dose of the medicine for the shortest length of time necessary to control the disease. Bladder cancer — Cyclophosphamide has a tendency to damage the bladder (see Bladder problems, below). This damage predisposes patients to the development of bladder cancer. The risk of bladder cancer (and of other bladder complications) is greater when cyclophosphamide is administered in the oral daily form. Among patients with Wegener’s granulomatosis treated with oral daily cyclophosphamide at the National Institutes of Health, the risk of bladder cancer was 6%. Among patients followed for up to 15 years, the projected incidence of bladder cancer was as high as 16%. Therefore, patients who have been treated with cyclophosphamide need to be followed indefinitely for the possibility of bladder complications of the treatment. The best method of screening for this complication is to check for red blood cells in the urine by performing a urinalysis, followed by cystoscopy if red blood cells are present. Patients shown to have bladder damage by cyclophoshamide, i.e. to have drug-induced cystitis, should undergo surveillance cystoscopies at regualar intervals determined by their urologists. When cyclophosphamide is administered intravenously, a bladder-protective medicine called MESNA may be given at the same time. MESNA appears to neutralize the toxic metabolite of cyclophosphamide (acrolein) that is thought to be responsible for the bladder complications. Additional strategies for decreasing the bladder toxicity of cyclophosphamide include: 1) giving intravenous hydration prior to cyclophosphamide; 2) taking all of the medicine in a single morning dose and washing it down with a large amount of fluid; and 3) drinking ample quantities of fluid throughout the day (eight 8–ounce glasses of water) to maintain a brisk urine output. In addition to cancer, cyclophosphamide may cause a variable amount of bleeding from the bladder, a complication known as “hemorrhagic cystitis”. This bleeding may range from a few red blood cells in the urine (invisible to the naked eye; only detectable by examining the urine under the microscope) to life–threatening hemorrhage from the bladder. If any bleeding from the bladder is discovered while a patient is taking cyclophosphamide, the medicine should be stopped until the bladder can be evaluated by cystoscopy. Cyclophosphamide may cause infertility in both men and women who are treated with the medication. As with many of cyclophosphamide’s side–effects, the risk of infertility appears to be related to the length of time a patient receives the drug (and probably the cumulative dose, as well). A woman’s age may also affect her risk of infertility, with the occurrence of early menopause higher in women over the age of 30 at the time treatment is begun. In a long-term study of the effectiveness of cyclophosphamide in treating lupus, the risk of infertility among women of childbearing potential was 57%.